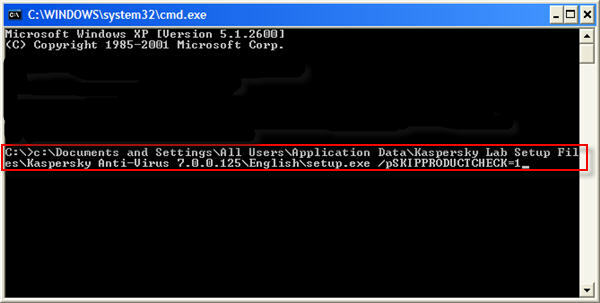 In Kaspersky Internet Security (KIS) and Kaspersky Anti-Virus (KAV) 7.0 or 2009 (version 8.0), the setup installation process will detects, scan and check for security software applications that when co-exist with Kaspersky antivirus module for concurrent functioning may slow down work of the user’s computer, or incompatible with the antivirus program installed. Such conflict programs including, but not limited to older version Kaspersky Anti-Virus, AhnLab SpyZero and V3 VirusBlock, Aluria Security Center, ALWIL Avast, AOL AntiVirus, Ashampoo AntiVirus, Avira AntiVir, BitDefender, BullGuard AntiVirus, CA eTrust AntiVirus, Suite Personal and PestPatrol, ClamWin AntiVirus, COMODO AntiVirus and Firewall Pro, Dr.Web AntiVirus, EarthLink Protection Control Center, ESET NOD32 and Smart Security, F-Prot, F-Secure Anti-Virus, G DATA AntiVirus Kit, GriSoft AVG, Kingsoft Internet Security and AntiSpyware, Lightspeed Security Agent, McAfee SpamKiller, AntiSpyware and VirusScan, Norman Virus Control, Norton AntiVirus, Confidential and Internet Security, Panda Platinum Internet Security and WebAdmin AntiVirus, PC Tools AntiVirus, RAV AntiVirus, Rising AntiVirus, Sophos Anti-Virus, StarForce SafenSec, Steganos Internet Anonym Pro, Sunbelt Personal Firewall, Symantec AntiVirus, Symantec Norton Internet Security, Spybot Search and Destroy, Sunbelt Kerio Personal Firewall, TEGAM ViGUARD, Tiny Firewall Pro, Trend Micro Anti-Spyware, OfficeScan Client and PC-cillin Internet Security, Trust EZ Firewall, VirusBlokAda AntiVirus, Windows Live OneCare AntiSpyware and AntiVirus, Virus Killer, Virus Dr., ZoneAlarm IMsecure, Anti-spyware, Anti-virus, Firewall, Security Suite and Wireless Security. 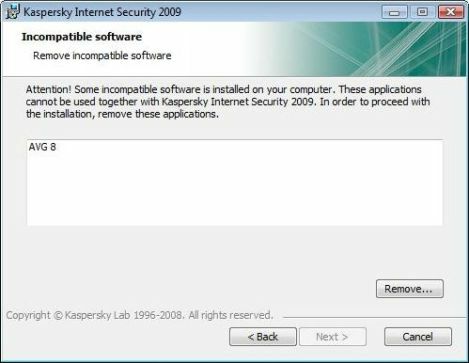 When Kaspersky installer detects any of the above software programs that are marked as not-compliant and cannot be used together with Kaspersky product, the setup wizard will require user to uninstall and remove all incompatible software before installation can continue and setup terminates, and user can only cancel the installation. However, sometimes, the detected product actually has never been installed on the system, or has been uninstalled before starting the setup, yet the Kaspersky setup keeps saying there is conflicting third-party software, despite it’s not in the system or has been deleted. 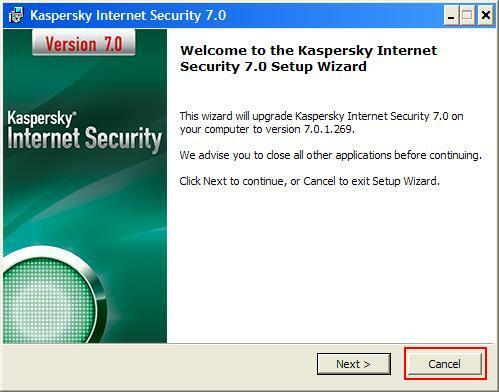 To fix and resolve the problem, Kaspersky provides a workaround, or an option or switch on Kaspesky Anti-Virus 7.0/2009 and Kaspersky Internet Security 7.0/2009 to skip and bypass the scan for incompatible software during the product installation. Run the product installation as per normal (where you will double click on the downloaded setup executable). In the Setup Wizard window, click Cancel to stop and exit from installation process. Note that by default these folders are hidden and cannot be viewed or displayed on folder listing. In order to view these folders, go to the Tools menu select Folder Options (or Organize menu select Folder and Search Options in Windows 7, Windows Vista, Windows 8 or Windows 10). Go to the View tab and in the list enable the option Show hidden files and folders. Open a command prompt window by typing Cmd into Start -> Run or Start Search box (in Windows Vista). Type the full path to the setup.exe file, and append to the end the switch of /pSKIPPRODUCTCHECK=1, making the command syntax as X:\path\setup.exe /pSKIPPRODUCTCHECK=1. Press Enter to run the Setup Wizard, which will now install the Kaspersky product without any warning on incompatible software. The incompatible software problem can also be fixed by removing registry keys related to the detected products.